This church is in Syria. And this book warehouse is in Iraq. Don’t believe us? It’s true – from 11–26 July all across London you could find yourself wandering into parts of the Middle East that you never thought you would visit or that some may have thought they would never see again. For Syrian artist Issam Kourbaj’s project Another Day Lost: 1579 days and counting…, he has reimagined London’s landscape by mapping it out and creating borders to correspond with the geography Syria and it’s neighbours so as to create the setting for his public installation that documents the Syrian refugee crisis. Koubaj’s installation will visualise the reality of the Syrian crisis by displaying ‘camps’ constructed out of waste materials, such as medicine packaging and discarded books, in the different London locations that loosely represent the geographic pattern of refugee presence outside the borders of Syria: the Goethe-Institut London and St. James’s Church, Piccadilly, roughly relate to the locations of camps along Syria’s southern border; Central Books in East London correlates to the cities of northern Iraq; 10 Golborne Road represents Lebanon; and Heath Street Church, Hampstead, approximates the location of camps in Turkey. 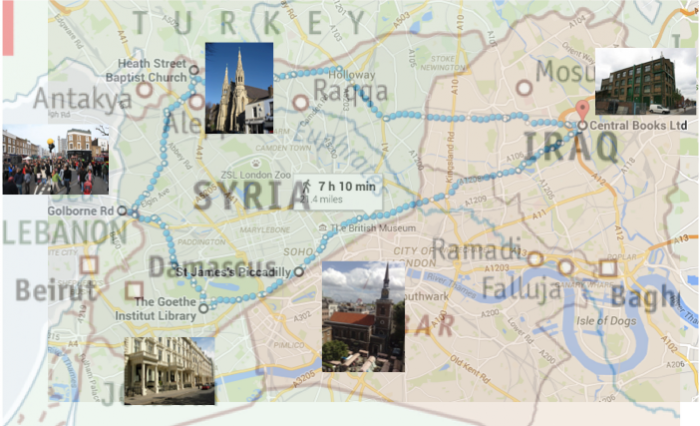 London meets Syria: a map of Syria and its neighbours overlaid on a map of ‘Another Day Lost’ locations in London. This public intervention is not a static piece but, as with the Syrian refugee crisis itself, will continue to grow throughout its two weeks in its various locations. 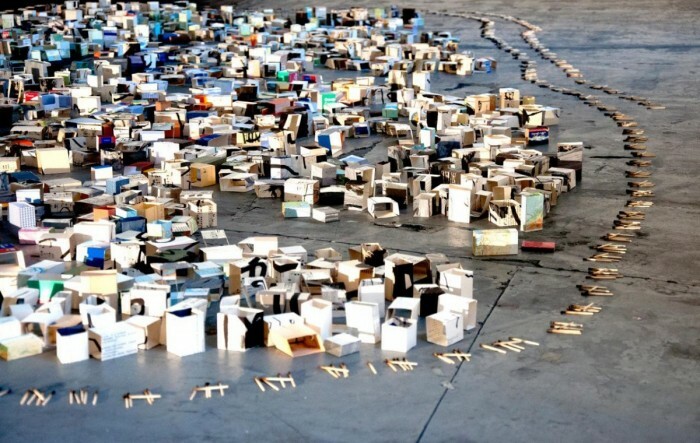 Around the ‘camps’ are ‘fences’ of used matches, lined up in a tally that represents the number of days that the Syrian conflict has been ongoing. The first day of the festival will mark day 1,579 since the Syrian uprising and each day a new match will be added – ‘another day lost’. This work puts perspective on a crisis that we see in the media almost daily but that often seems too overwhelming to grasp. Another Day Lost hauntingly visualises the magnitude – both temporally and geographically – of the situation, whilst the use of discarded items implies both the difficult conditions of Syrian refugees and perhaps the Western world’s seemingly negligent attitude towards them. Another work that will be mapping out an alternative geography in London is Younis Baba-Ali’s Carroussa Sonore, which he describes as an “ephemeral aesthetic experience in ambulation, drawing through sound a new cartography of the city, which lasts only the time listening”. In this piece, Baba-Ali uses the traditional wheeled cart, or Carroussa, of Moroccan street merchants as a means to transport speakers playing the sound works of multiple international artists, including his own, throughout public spaces. For the Shubbak Festival, Baba-Ali’s work will be on show from 11–26 July in and around the Chelsea Theatre but will also be roaming around, appearing at the Hafla on the Square (11 July); the John Madejski Gardens at the Victoria & Albert Museum (18 July); and at the closing concert ‘The Mix’ (25 July). Carroussa Sonore juxtaposes the context of trading and commerce, as implied by the cart, with the transient product on offer – sound. The selection of sound works includes Baba-Ali’s distinctive installation Everyone is called Mohamed – a subtle sound installation repetitively gently calling out the most popular name in the Arab world. Mohamed is also the name given in the Maghrebi culture to any male person who is not known and in that way the work is at once an invitation to interact with the artist as well as a challenge of unfamiliarity. Also inviting audience interaction and participation is Alia Farid’s performance A Stage for Any Revolution, which will take place on Edgware Road from 11–26 July. The power and scope of public interventionism and participation has been a topic that has inspired many artists from the region, particularly since the Arab uprisings of 2011 that saw millions of citizens take to the streets in protests. But beyond that, Middle Eastern culture has long held a very special relationship to public space – whether it be street cafes, parks, markets or squares – as social spaces for gathering with friends and family or as entertainment spaces for activities such as listening to stories and songs or playing games. 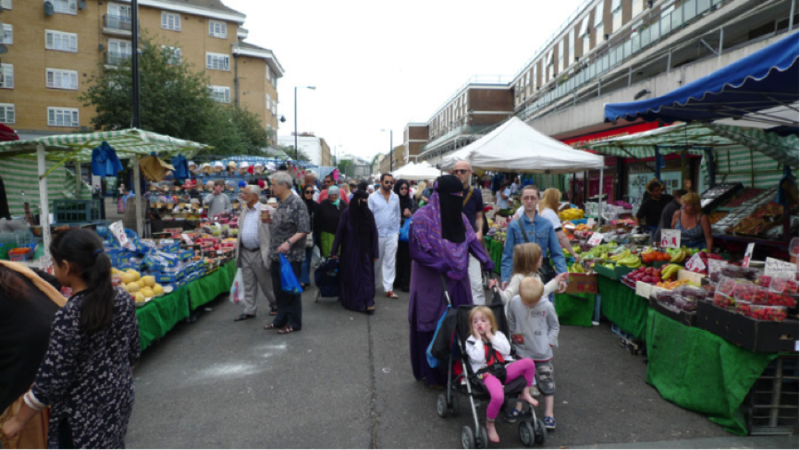 A view of Chruch Street Market just off of Edgware Road. Alia’s performance comes as a result of six months of research as part of a residency programme that explored these themes as well as investigating the possibilities for public life by generating interest in shared spaces, values, and responsibilities over the development of the neighbourhoods that shape our cities. 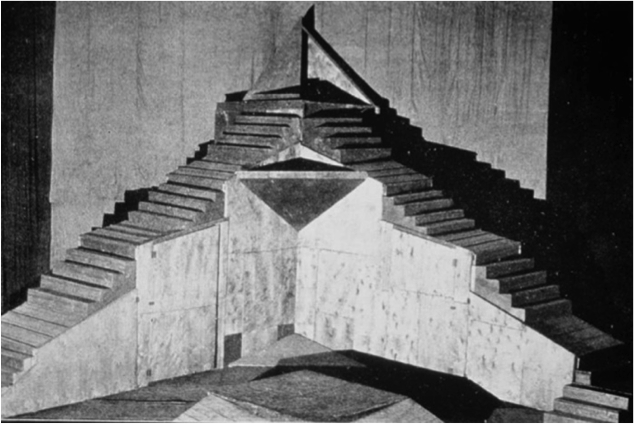 The ‘stage’ that Alia has designed is based on an architectural model from 1929 by constructivist set designer Victor Shestakov and will open for the public in Edgware Road to use as a collective space for meeting, holding discussions, giving speeches, presenting and watching performances, as well as launching a new publication entitled Continuous City: Mapping Arab London. The stage will bring a spirit of the ‘Arab Street’ and sense of community participation to the famously ‘Arab’ street of Edgware and offer a continuously changing array of events. The final piece of public interventionism is not to be found on the streets but rather on the walls. ‘Breaking Cover’ offers a selection of street art and graffiti works by emerging street artists from the Gulf taking place at Southbank Undercroft, Stockwell Legal Wall and Leake Street. The artists themselves have different styles and inspirations but are all part of a growing urban art scene in the Gulf region. Shaweesh is a young Saudi Arabian artist who produces pop, street and digital art and believes that street art can play a role in initiating cultural dialogue on both a national and international level. He was inspired to create graffiti works after being exposed to street art through films and YouTube videos and names Banksy as a personal hero. His style is, therefore, a blend of global pop culture and traditional Saudi themes to create what he describes as “works of harmonious chaos”. Fellow Saudi artist Talal Al Zeid has similarly eclectic inspirations behind his work, including graffiti, pop art, vintage comics, classical cartoons, portraits, underground and hip hop. Moving from a young age around various locations in Europe and studying in America have undoubtedly encouraged the wide-ranging themes in his painting. 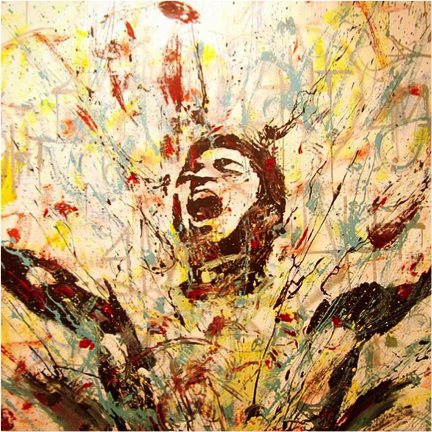 His distinctive Pollock-esque style – or, as he calls them “drippy artworks” – give his pieces a feeling of fluidity and dynamism. Dubai-born, Indian-Canadian artist Fathima Mohiuddin’s artworks also invoke this feeling of fluidity and movement in an almost hypnotic way. She describes her work as “mark-making” and it’s easy to see why – her otherworldly works are created with permanent black markers and trace interlaced webs of lines all over her chosen surfaces. These surfaces range from paper and canvas to walls, ceilings, found objects and even the human body. Her works seem to at once speak to calligraphic forms and the traditional patterns of henna as well as more organic and abstract forms that appear to have a life of their own. The distinctive thing that ties all of these unique works and styles together, and that speaks to public intervention and performance more generally, is the transient and changeable qualities of each to their environment and, in some cases, their audience. 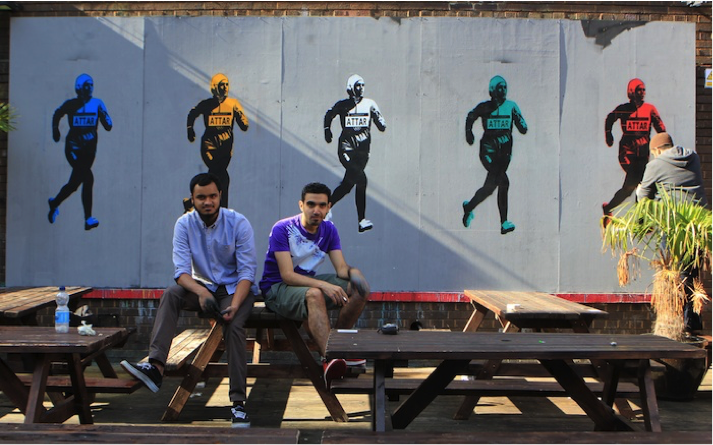 Each piece will take up its position in various locations throughout London and use its walls, its streets, its people and its geography as the basis through which to tell its story of Arab culture, history and identity. So pay attention in the next few weeks when you’re walking around London – you may just find yourself inadvertently exploring Middle Eastern borders, peeking at a Gulfi street work or participating in a performance.